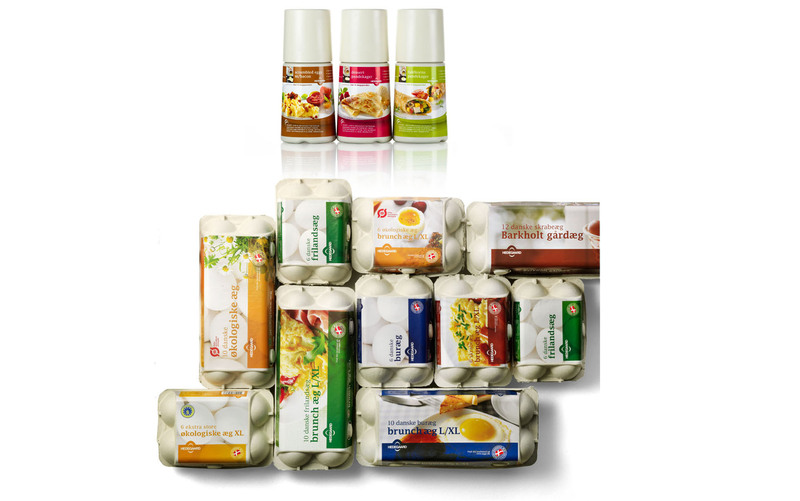 In 2005 Scandinavian DesignLab approached egg manufacture, Hedegaard foods, with the ambition to sell the company a new packaging design, as the design at the time was outdated. Hedegaard foods kindly, but firmly, rejected the offer. Fortunately the dialogue between The Lab and Hedegaard continued, and a long and close cooperation was launched, with a brand strategy project that same year. visual identity and pack design was developed based on this DNA. The identity challenged the way an egg manufacturer visually could portray itself, moving away from the traditional, cosy and romantic representation of the egg-production in visual language and introduced Hedegaard as the innovative, modern, competent and safe manufacturer and supplier of eggs. from the basic line by focusing on “Madglæde” - the love of good food - and a new product line of “Shakers”, which contains prepared pancake dough and omelette mix. In 2011, Hedegaard foods captured the position as market leader in the Danish market and has held the position since. I 2012, Hedegaard foods entered the Swedish market through the acquisition of Svenska Lantägg, which in the future will also utilise the identity and packaging design created by Scandinavian DesignLab.